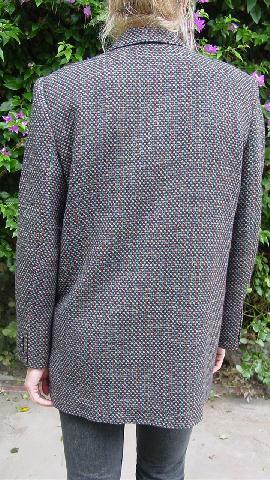 This vintage 100% pure wool jacket is by Giorgio Sant'Angelo. 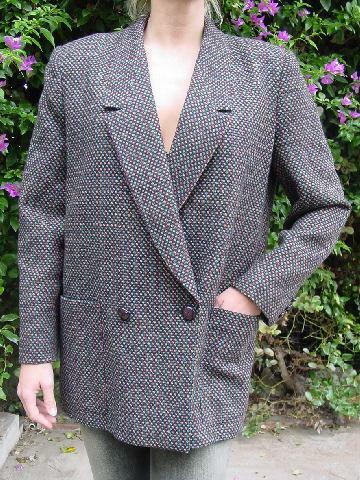 It has a black full lining and has long lapels. There are two brown faux leather buttons in the front and two lower open lined pockets. 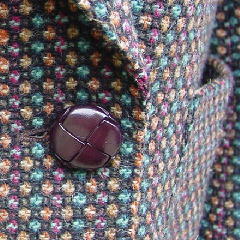 It has shoulder pads and long sleeves with 3 faux leather buttons on each. It's in aqua blue, light brown, magenta, antique white, and burnt orange. The tag says it's size 12.
side to side bottom hem 22"